Pâte à choux is used to create these light as air pastry shells. It’s a pastry dough (or choux paste) and is a foundational element in French pastry. It can be used for a myriad of other sweet and savory foods, such as eclairs, gougères, profiteroles, etc. The ingredients are simple: water, milk, salt, butter, flour, and eggs. There are no leaveners used; instead the high moisture content from the eggs creates the ‘puff’ during baking. As the choux bakes, the liquid evaporates into steam (which expands the dough) and leaves behind a hollow interior. For added crispness and flavor, these choux puffs have an ultra thin layer of sweet tart dough (pâte sucrée) baked onto their exterior. This not only gifts it with a sweet and extra crispy crust, but also helps to produce a uniformly shaped final choux puff. Perfectly domed and ready to be filled with whatever your heart desires. For the raspberry rose cream, I use dried culinary food grade rose petals to flavor the cream. 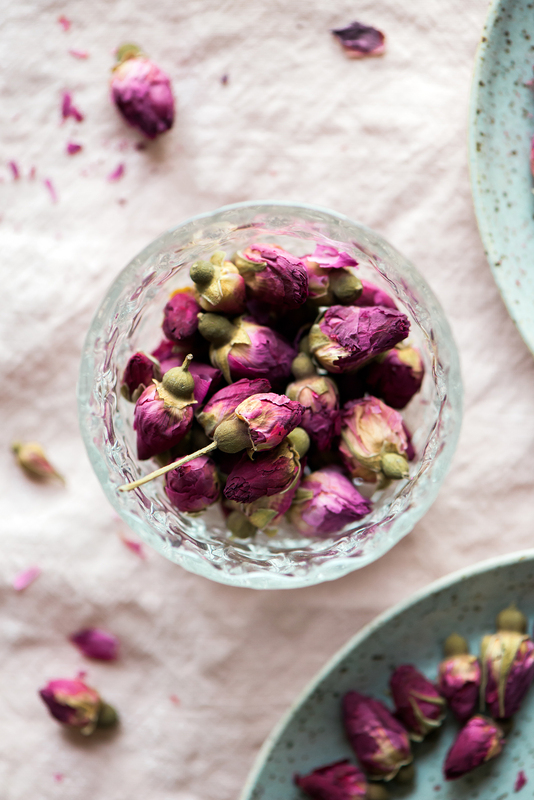 Steeping the dry petals captures the rose flavor and aroma in a way that rose extract or rose water can’t. 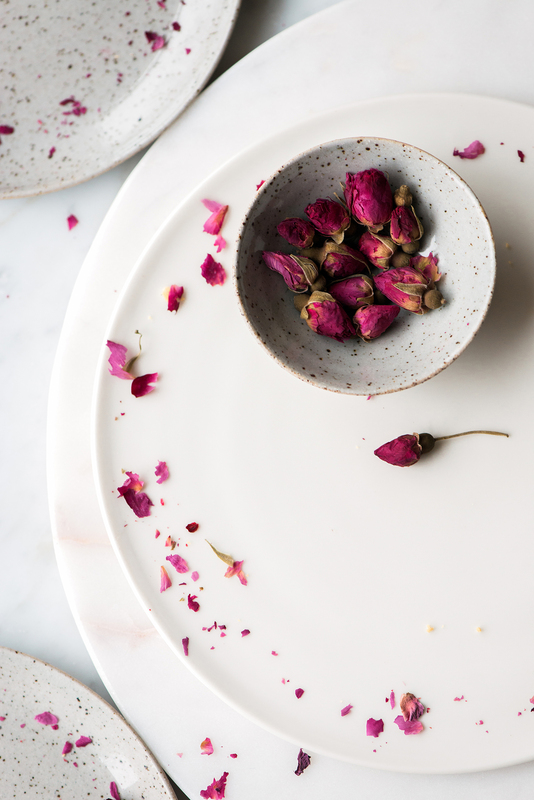 However, if sourcing food grade dry rose petals isn’t possible, feel free to omit them. The vanilla bean white chocolate ganache and raspberry rose cream will both need to chill for at least four hours. To make this recipe a simpler process, I usually make any fillings that need to be chilled to set a day or two beforehand. The pâte à choux can even be made in advance (a day before or even a week before), piped out onto a lined baking sheet, and placed in the freezer. Once the choux mounds are frozen, transfer them to a freezer bag and store them until they’re ready to be baked. Same goes for the sweet tart dough. These Valentine’s Day choux puffs are multi-layered and worthy of every single ounce of loving attention. In the bowl of a stand mixer, with the paddle attachment, cream together the soft butter and powdered sugar for about 1 minute. Mix in the almond flour, vanilla bean seeds, and fleur de sel. Add in the egg and mix until combined. On low, add in the flour and mix just until dough comes together. Roll out the tart dough, between two pieces of parchment paper, to 1/16-inch thickness. Place the parchment encased dough onto a baking sheet and transfer to the freezer. Store in the freezer until frozen firm, at least 20 minutes. Once frozen, remove dough from freezer and cut out a dozen 2-inch rounds using a round biscuit or cookie cutter. Transfer any uncut dough and rounds back to the freezer for storing until ready to use. Store any leftover tart dough, wrapped airtight in plastic wrap, in the freezer for up to 1 month. Recipe adapted from Pastries by Pierre Hermé. Preheat the oven to 400F (204C). Line a large baking sheet with parchment paper or a Silpat. Prepare a large piping bag fitted with a round pastry tip. In a saucepan, combine the water, milk, sugar, fleur de sel, and butter. Bring to a boil, remove from heat, and immediately dump in all the flour. Quickly stir in the flour, using a wooden spoon or heat-proof spatula, and then place the saucepan back over medium-high heat. Continue to stir the mixture, without stopping, until the paste is smooth and shiny, about 1-2 minutes. It will pull away from the sides of the pan and leave a thin coating of cooked paste on the bottom when ready. Transfer the paste to a stand mixer bowl fitted with the paddle attachment. Mix paste, on low, for about 1 minute to cool it down. Gradually stream in the eggs, allowing each addition to mix into the paste, until all is added. Scrape down the bowl and mix, on medium, until pâte à choux is smooth and shiny, about 30 seconds. Tip: Wet the tip of your finger and drag a trail through the final choux to check for the proper consistency. Choux should slightly fall back on its mark and be lightly elastic in movement. If the choux is too stiff and doesn’t slightly fall back on the mark, then add a little more egg. Choux should never be runny. Transfer the pâte à choux to the prepared piping bag. Pipe out 12 choux mounds, about 2-inches round and 1/2-inch tall, onto the prepared baking sheet. Evenly space them 2-inches apart to prevent touching during baking. Tip: At this point, the baking sheet can be placed in the freezer until the choux mounds are completely frozen if desired. Once frozen, they can be transferred to a freezer bag and baked off as needed. Place one frozen sweet tart dough round on top of each choux mound. Place the baking sheet in the oven and immediately turn down the oven temperature to 350F (176C). Bake choux puffs for 40 minutes. Rotate the baking sheet and turn down the oven to 325F (163F), then bake for 25 minutes more until choux are deeply golden. Remove from oven and set on cooling rack to cool. Store any unfilled choux puff shells, in a large freezer bag, in the the freezer for up to three weeks. In a saucepan, bring the heavy cream and scraped vanilla bean pod and seeds to a boil. Pour over the chopped chocolate and let sit for 1 minute. Discard the vanilla bean pod. Whisk the chocolate mixture until thoroughly melted and combined. Set in the refrigerator to chill, at least 4 hours. 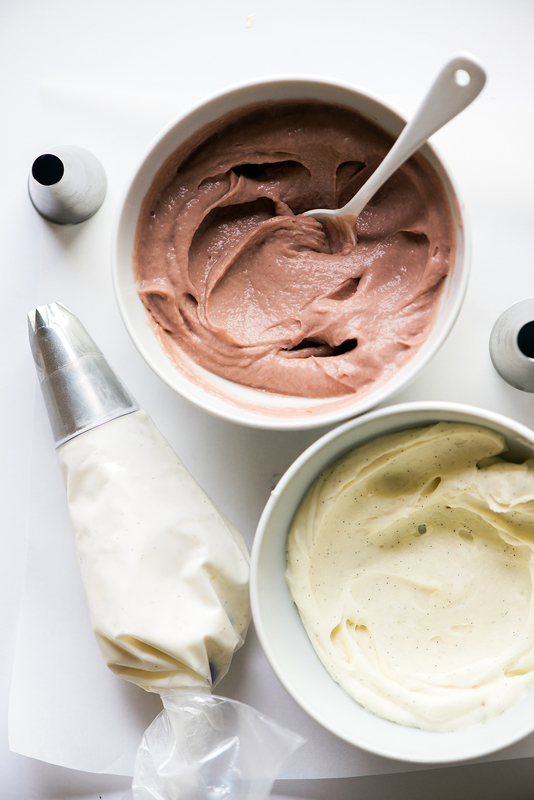 Once chilled and ready to use, transfer the ganache to the bowl of stand mixer fitted with the whip attachment. Whip ganache to medium-stiff peaks (careful not to over whip or it’ll become too stiff to pipe). Transfer to a piping bag fitted with a medium round pastry tip. In a saucepan, combine the dry culinary rose petals and heavy cream. Bring to a simmer and remove from heat. Cover and allow the rose petals to steep for 10 minutes. Meanwhile, bloom the gelatin sheet in a bowl of very cold water (enough to completely submerge the gelatin, at least 8 oz/227g). Set aside for 5-10 minutes or until gelatin is soft and flexible to the touch. Gently squeeze out water from gelatin right before adding it to a warm liquid. If using powdered gelatin, sprinkle over 1 Tbsp of very cold water and set aside to bloom for 5-10 minutes. Gently heat to dissolve. Once the cream is done steeping, strain into a bowl and reweigh the cream back to 4 oz (114g) by adding more fresh cream. Transfer rose cream to a clean saucepan and add raspberry puree. Place over medium-high heat and bring to a boil. Meanwhile, whisk together egg yolks and sugar in a bowl. Temper the egg yolk mixture by gradually streaming in the hot raspberry cream, whisking constantly to prevent cooking the yolks. Tip: Set the egg yolk bowl on top of a slip resistant mat or wrap a wet hand towel around the base to secure the bowl in place. Once all the cream has been whisked into the yolks, transfer the mixture back into the saucepan. Cook, over medium heat while stirring constantly, until mixture reaches 185F (85C). Strain through a fine mesh strainer into a clean bowl and whisk in the bloomed gelatin. Place plastic wrap directly onto the surface of the raspberry rose cream and set in the refrigerator to chill until set, at least 4 hours, preferably overnight. Once the rose cream is set and ready to use, stir gently just until smooth and creamy. Transfer to a piping bag, fitted with a small round pastry tip, and keep chilled until ready to fill choux puffs. Store any leftover raspberry rose cream, in an airtight container, in the refrigerator for up to three days or in the freezer for up to a week. In the bowl of a stand mixer, whip the heavy cream, mascarpone, sugar, and vanilla bean seeds to medium-stiff peaks. Tip: Careful not to over whip the cream as it’ll continue to stiffen while it’s being piped. Transfer mascarpone whipped cream to a piping bag, fitted with a large star pastry tip, and keep chilled until ready to pipe onto choux puffs. 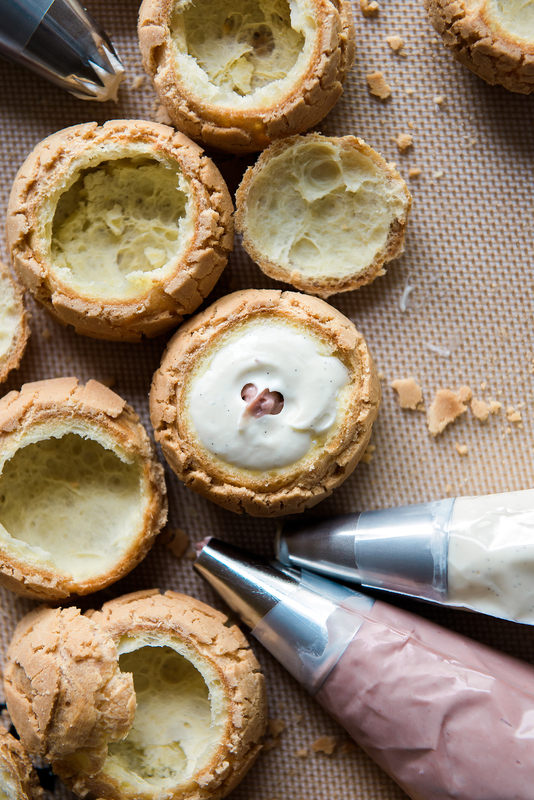 Using a serrated knife, carefully cut the tops off of each choux puff shell. Set the cut tops aside. Pipe the whipped vanilla bean white chocolate ganache into the shell until 3/4 full. Insert the tip of the raspberry rose cream piping bag into the center of the ganache and squeeze in cream until the shell is full and slightly mounded. Repeat the filling process with each choux puff. 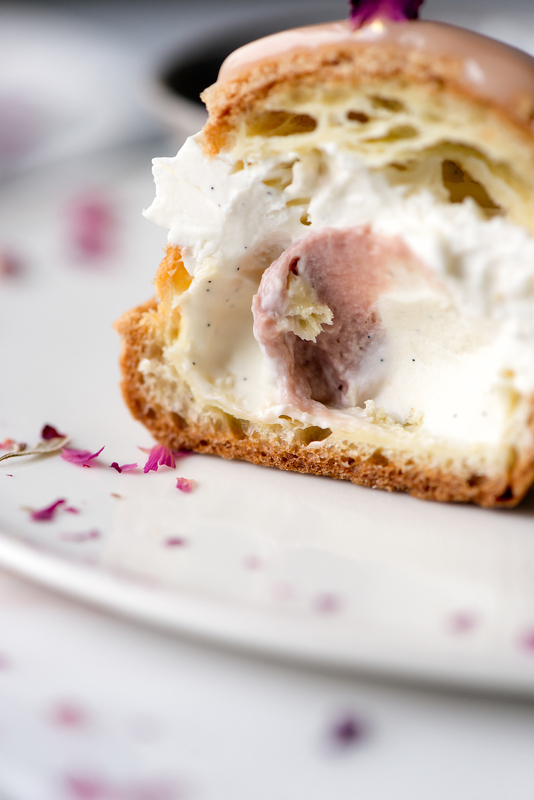 Onto each choux puff, pipe on a swirl of the mascarpone whipped cream and rest one reserved cut top onto the swirl. 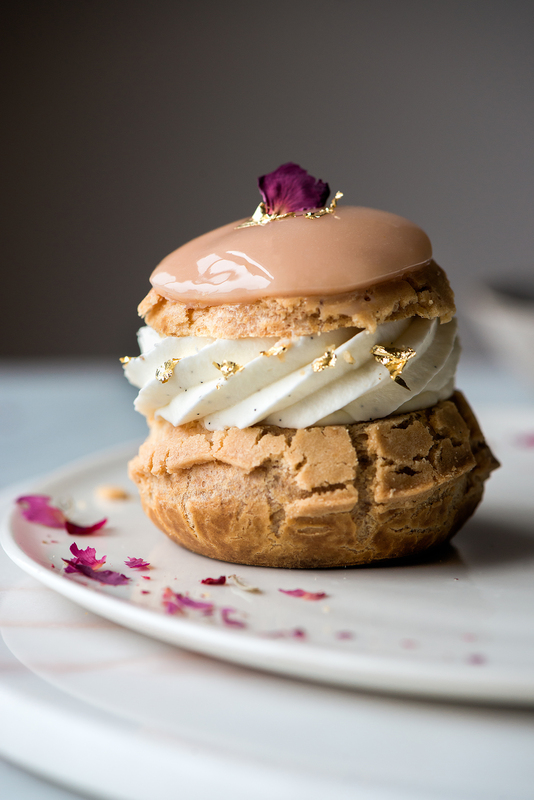 Decorate the finished choux puffs however you desire (dried rose petals, gold leaf, glaze, etc.). 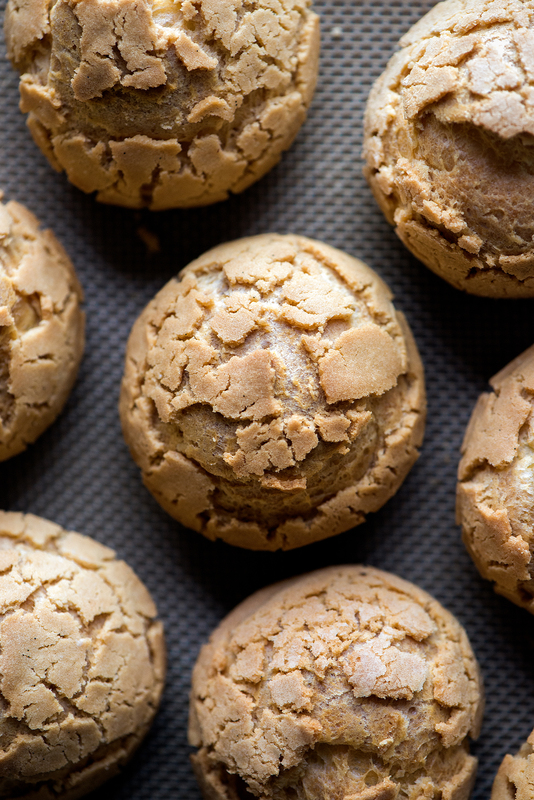 Choux puffs are best enjoyed the same day they’re filled; therefore, serve immediately and enjoy. Rose and raspberry are match made in heaven. I first had that through Isphan macaron, loved it!! Never made choux pastry but something similar in puff loaf. Beautiful photographs which I am drooling over last half hour!! Thank you, Suchi! The Ispahan macaron is one of my favorites from Pierre Hermé too. He is a pastry genius and is always a source of inspiration. You should try making choux pastry sometime. It’s surprisingly easy and I think you’ll like it. :) Happy almost Valentine’s Day! Thank you, Rebecca! Happy Valentine’s Day to you! Hi Heather! It’s a raspberry white chocolate glaze that I had leftover from last weekend’s pastry projects. It came in handy for decorating these choux puffs. Yes, I love adding layers of flavors to pastries. The great thing about layered recipes is that you can choose to make all of them or cherry pick the ones you want. It’ll still taste great! These look just heavenly, Teresa! Definitely more complex than any pastry I’ve ever attempted but you have me inspired to try something more ambitious! Thank you, Kayleigh! I wanted to create something extra special for Valetine’s Day this year and these choux puffs came to mind. They’re more complex than other recipes on Now, Forager, but if you make each part of the recipe a little at a time (fillings on one day, choux on another day, etc.) it helps make it easier. Hope you enjoy them! Absolutely stunning! I love the idea using dried roses. Bravo! Thank you, Amisha! I’m a sucker for vanilla bean specks. Happy (almost) Valentine’s Day! These puffs are so exquisite! 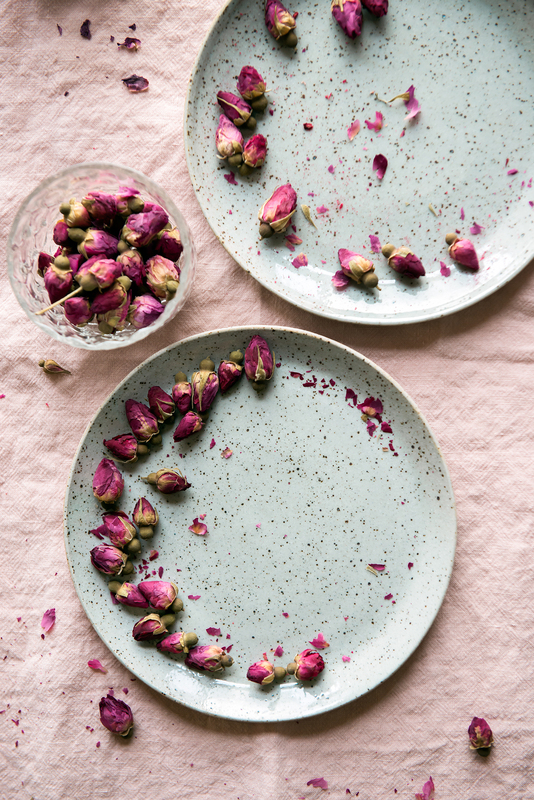 Almost too pretty to eat, such a beautiful treat for Valentine’s Day! Thank you, Laura! A special treat for a special day of love. Awww! Thanks, Elise. You should make this! Stunning as usual! These are beautiful, you’ve got me inspired to try something new! Thank you, Lauren! Happy Valentine’s Day! These are just stunning – I love the combination of rose and rasperry, it’s the perfect marriage. I love Ispahan too, so delicious. These look like perfect examples of choux buns. Teresa, these photos are stunning. I’m consistently blown away by your work, but these are seriously gorgeous. Thank you, Kate! Hope you had a Valentine’s Day full of love. Hi Teresa, perhaps I misread something but I’m just a little confused with what you do with the tart dough… should you sort of form a cup/shell to place overtop of the choux mounds? or just lay them ontop flat? This is definitely a more complex recipe than I’ve tried before and I want to make sure I know all of the details before attempting to make these! They look to die for!! Thank you, Olivia! For the tart dough, lightly rest the cut out round flat on top of the choux paste mound (like a hat). They’ll wobble slightly on top of the choux as you transfer them to the oven, but then will immediately start to “melt” onto the choux after a minute or so. It’s ok if they’re not perfectly centered either. Each will bake uniquely and that’s apart of their beauty. Best of luck!